If you’re like most Americans, you own too much “stuff.” And you’ve probably taken steps over the years to accommodate that stuff in your home, like buying bins, totes, and shelving units and expanding closet space or other storage areas. Maybe you’ve even rented an off-site storage unit. When you think about it, spending money to keep excess items stockpiled out of sight is a little silly. And it probably makes you feel unhappy or uneasy, too. After all, those prized possessions are just sitting idle and unused when plenty of people in the world would probably love to have and use them. It’s true that stuff causes stress. There’s the guilt of not using perfectly good items, and having too many things sitting around makes keeping your home and property clean more difficult. Plus, stored items can even be dangerous or create health hazards. Who needs to worry about all of that? If downsizing your home has been on your mind as you approach retirement, you need a solid strategy to reduce your stuff. Let our list of ideas and tips be your guide to getting started with downsizing, and “supersize” your happiness today! Before you begin any downsizing project, it’s good to understand why you have too much stuff in the first place. 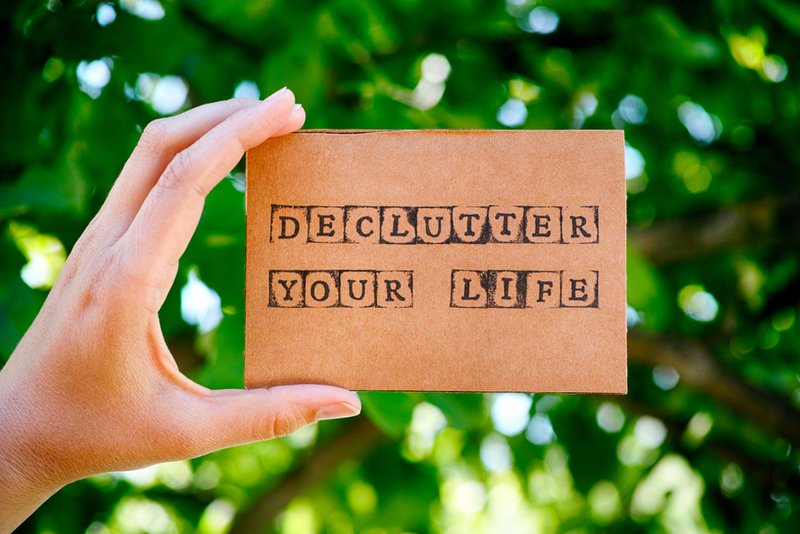 (You don’t want to re-clutter after you declutter, after all!) Think about why you tend to keep things. Essentially, what’s your relationship with clutter? You’re a serial purchaser. For instance, you are too busy to search through all the things you already own to find something like, say, an umbrella when it’s supposed to rain while you’re on the way to an important event. You stop off and buy a new umbrella, use it once, and then take it home to join the 10 other umbrellas you already have. You’re a “prepper.” You like to be prepared for anything, which makes you save items you think may be useful “someday” or “just in case.” It’s especially bad when you save things for a number of loved ones in addition to yourself, which is not uncommon. You can’t get started. You simply don’t know how to tackle the massive project of cleaning up and clearing out around your home, so you do nothing. Clutter is holding you hostage! You have probably heard this tip before: make three piles of your belongings – one with things to keep, one with things to sell or donate, and one with things to throw away or recycle. Have you ever tried it and quickly became frustrated when you couldn’t decide how to categorize the first or second item you picked up? While this method of cleaning out is tried and true, there are a few tricks to making it work for you without becoming overwhelmed. Start small. Never aim to clear out your entire house at one time! In fact, do not even intend to clear out one entire room on your first try. Limit yourself to filling just three small boxes, especially if you’re feeling particularly stressed out about the project. Just go through a single closet or a few kitchen cabinets. Desks and filing cabinets in home offices are also great places to start. Assess your progress. Is that “keep” box overflowing compared to the other two? Set it aside for a few days or a week while you donate, sell, trash, or recycle the contents of the other boxes. Review your “keep” box (preferably with help from a friend or family member). Are there things in that box that you didn’t think about at all while it was set aside? Those items need to move to the sell/donate box immediately. If you’re still unsure, consult your friend or family member and allow them to make the call. The Orlando Sentinel newspaper reported in 2016 that America had about 53,000 self-storage facilities compared to the roughly 10,000 facilities spread across the rest of the world. That’s right…the entire world. And, over 90% of the space in those facilities is already rented! Some people are getting very rich off of our nation’s obsession with keeping things we don’t actually need. It’s likely that you’ve heard of the minimalism movement that’s been gaining in popularity. Maybe you’ve even read some of the recent books on the joy that we can achieve in life from “tidying up.” It’s true that we do not need to take decluttering and downsizing to such an extreme, but resources like books and videos about clearing out the excess stuff are helpful as inspiration. Additionally, downsizing does not have to be, and really should not be, a solitary endeavor. As we already touched on, calling in friends and family members to help you declutter can be fun. It is a great opportunity to share stories with kids and grandkids about specific items and times in your life. They’ll love to hear these memories! And you can send them home with things that either already belong to them (you know you have boxes of your kids’ abandoned childhood toys and books in the attic!) or that they have admired in the past. It’s a win-win for everyone involved. If you’re the type of person who likes to collaborate with professionals to make sure the job gets done right the first time, there are also plenty of resources out there for you. Look for seminars like the ones we often host here at Homestead Village on the topics of downsizing and simplifying your life in retirement. Or pay someone to come in and downsize for you! There are now many businesses that specialize in downsizing for older adults. As you approach the process of minimizing the stuff in your home, consider the future for a moment. Should your home itself be placed into the “sell” box? Perhaps you weren’t considering downsizing out of your current home, but once you’ve minimized your stuff, you may decide that a smaller house would better suit your active lifestyle in retirement. After all, who wants to keep up with all of the maintenance and yard work a large home requires? And if you really don’t want to worry about any maintenance at all, it’s definitely time to consider a move to an all-inclusive retirement community. If you want more time for fun and family, think about supersizing your happiness with a move to a community like Homestead Village where everything is taken care of for you! Get in touch with us today to schedule a tour or just chat with us about your downsizing project. Homestead Village features a variety of living options from apartments to carriage homes that offer plenty of storage space. Because, while downsizing is great, it’s sometimes impossible to squeeze everything you need for hobbies, holiday decorating, and entertaining into a broom closet! If you’re concerned about still having generous storage space available to you, our Farmstead homes with basements are sure to delight. Come see for yourself!